By enabling automatic update checks, your instance will determine if it's running the latest release of GitHub Enterprise. 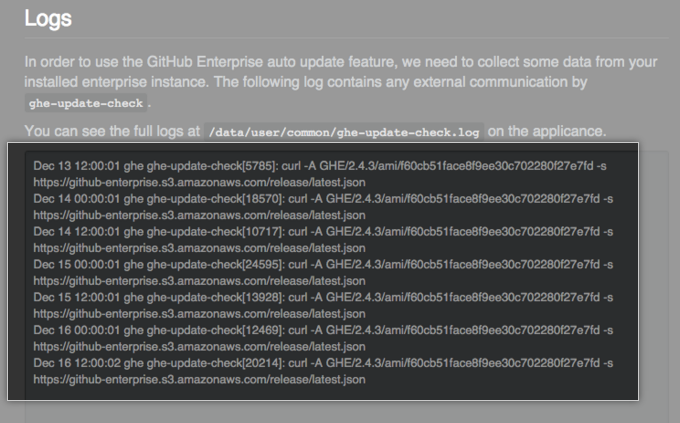 If it isn't, GitHub Enterprise will download the latest release for you. An administrator can then perform the upgrade. Tip: To enable automatic update checks, you must have an Internet connection capable of reaching https://github-enterprise.s3.amazonaws.com. As a site admin, sign in to your GitHub Enterprise instance at http(s)://[hostname]/login. Click Yes, automatically check for updates. An administrator can then perform the upgrade.